The cool thing is we do have access to such telescope (sorta/kinda), and my colleagues and are are currently using them to try and understand dark matter and dark energy. The "telescope" I'm talking about is what is known as a gravitational lens. Einstein's Theory of General Relativity predicted that gravity could bend light. In 1937, none other than Fritz Zwicky realized that, if two galaxies happened to appear along the same line of sight to the Earth, the middle galaxy can create magnified images of the more distant galaxy, and that these images can be used to weigh the middle ("lens") galaxy. In 1979, the first known instance of gravitational lensing was discovered by Dennis Walsh, Bob Carswell, and Ray Weymann. A gravitational lens is not exactly like a big telescope. It only works in one specific direction (which you can't choose) and it creates very distorted images (which you have to disentangle from the lens galaxy). But by measuring the bending of the light, it is possible to determine how much matter (both visible and invisible) is in the lens galaxy. Another really useful thing about gravitational lenses is that you can use them to measure things like how fast the Universe is expanding and how much dark energy there is in the Universe. These measurements have been made elsewhere, but gravitational lenses test different physics, so if you get the same answers with gravitational lenses as with other methods, you can be more confident that dark energy, dark matter, and your measures of the expansion of the Universe are real. As you might guess from the name, gravitational lenses rely on gravity to bend the light. And that gravity comes from matter. When we look out in the Universe, we see matter everywhere. All of that matter has gravity, and all of it pulls on the photons of light. So, even though the lens galaxy does most of the bending (because it is aligned just right), other nearby galaxies act like imperfections in that lens, messing up the fine measurements we'd like to make. 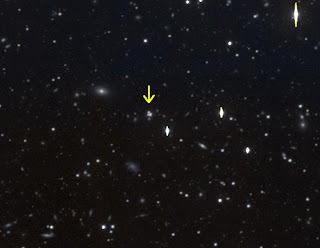 Near the center of the picture at the top of this post (click on it to see a big image) there is a gravitational lens. Look for three white dots really close together and marked by the arrow. 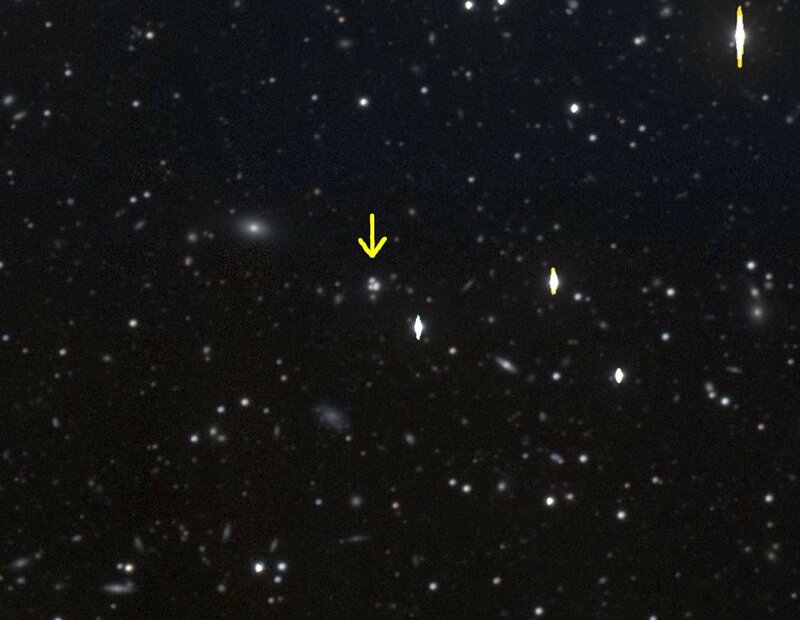 The three dots (actually four; two are so close they look like one in this picture) are the images of a very distant (9.7 billion light years away) quasar. The lens galaxy is hidden in the glare of the quasar, and is located 6.1 billion light years away. Now, see a lot of the faint fuzzy dots right around the quasar? Those are galaxies that also live 6.1 billion light years away and are neighbors of the lens galaxy. Each of those galaxies has its own gravity pulling on the light. And all the other fuzzies in the picture are galaxies, some relatively nearby, and some very far away; some are true neighbors of the lens galaxy, and others are chance alignments. All of these galaxies contain billions of stars and tugging on those photons of light. The big question is: how much does all of that pulling affect our measurements? In the small community of astronomers who study gravitational lenses, there is a lot of debate about this issue. Some people think it is a big effect, some people think we can ignore it. Even within our own team we disagree. For the past several years, my team has taken pictures like this one of dozens of gravitational lenses. My job has been to identify every single smudge in these images and determine if it is a distant galaxy or a star in our own galaxy, and how bright each object is. I've spent the last two weeks combing through a dozen images for any galaxies my automated computer algorithms have missed -- it's a small percentage, but when there are 20,000 galaxies in a picture, that's still a hundred or more in each image. Once I've identified these missed galaxies, I've had to make measurements of these, one by one. It's tedious but necessary work. Another team member, Dr. Ivelina Momcheva, used spectra of hundreds of galaxies around each lens to figure out whether the galaxies are neighbors of the lens galaxy or chance alignments. And our newest team member, graduate student Ken Wong, is putting all of that information into a complex computer model that calculates how much distortion all of the galaxies cause. So, what's next? Writing. Lots and lots of writing. We need to summarize all of our work, tabulate each bit of data, and have it reviewed by our peers and published in professional journals. For a project of this size, this publishing will be a herculean task! But we need to do it so other people can make use of our data. We've already sent one paper off for review, and we hope to finish two more this summer. Even as we write, we are looking ahead to the future. Perhaps those lens galaxies that seem well-constrained with a minimal amount of data are the best lenses for doing the cosmology measurements, and we can do some measurements. Perhaps we should compare measurements made using the simple systems with the complex systems and see if we get different answers. If the answers we get are pretty close, maybe this means all the neighbor galaxies don't do much after all. And we'd also like to study the lens galaxies and their neighbors. How big are they? How fast are they making new stars? How different are they from nearby galactic neighborhoods? This is a great thing about astronomy research: we always end up asking more questions than we answer. Finishing one project almost always offers you a dozen different directions for your future path of research.